We completed the monitoring of white-tailed eagle in the hatching season 2016. 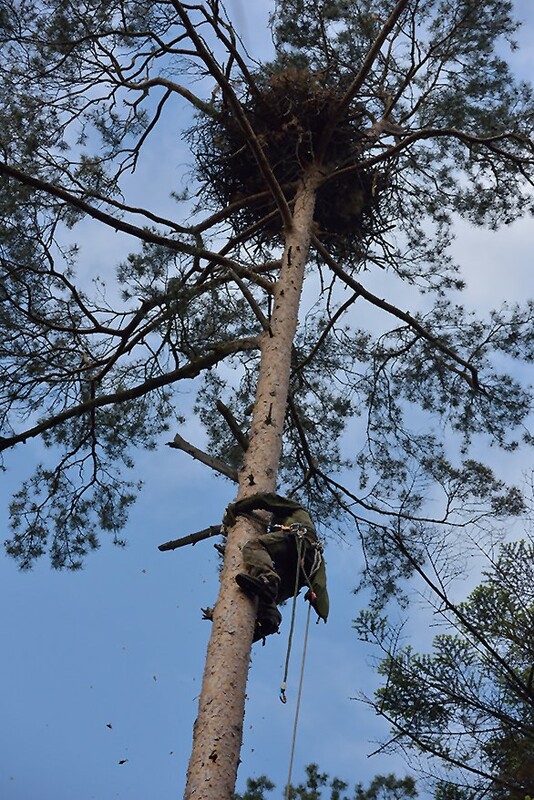 We have inspected 50 nests of white-tailed eagle, located between Łukowskie woods beyond the northern limits of the region, to the area of Mielec and ponds in Starzawa, near Przemyśl ;) Our work consisted in finding new nests and 2 inspections in the hatching season, involving ringing of nestlings. 21 nests of white-tailed eagle were located within Natura 2000 bird habitats. Unfortunately, 2016 was not a good year for this species in the Lublin region. In the majority of cases not a single youth was raised. Within the Natura 2000 area of Parczewskie woods, none of 4 known pairs have raised young eagles. No triplets were also observed this year. 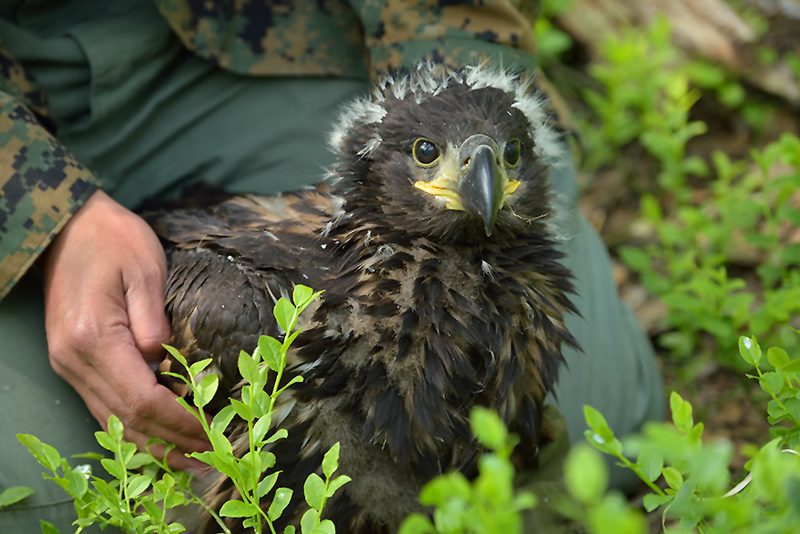 Nearly half of nests observed losses, there were 2 nestlings in 18 nests, and single nestlings in remaining nests. We hope that the birds shall have better luck in the coming year. 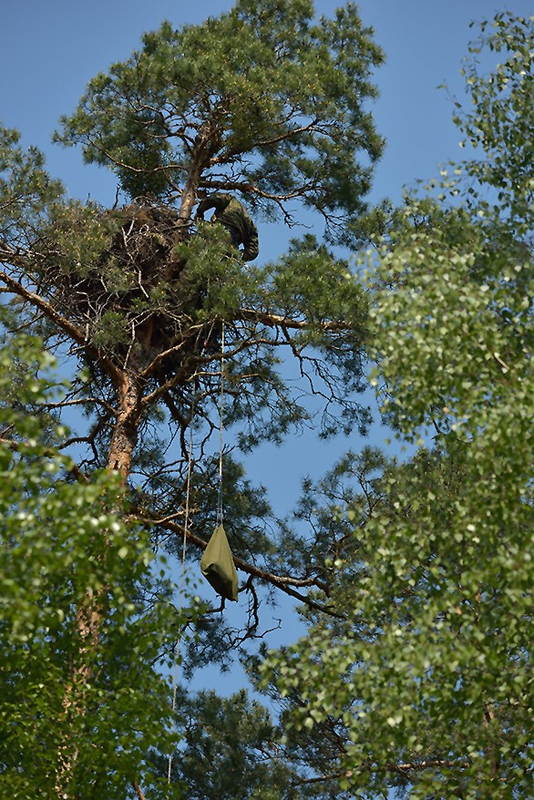 Photo 1 The majority of white-tailed eagle nests in the Lublin region is erected on pines. Photo 2 The white-tailed eagle usually chooses a sold tree, form which he can observe the whole area. In the background, ponds in Topornica in the Zamość region. Photo 3 Birds are ringed on earth, where they are conveniently transported. Inspections of overhead power lines were carried out on two occasions. The first in August (7 to 15/8) and the other in September (10 to 20/9). Such a election of dates enabled not only physical penetration of the area under the power line, (harvesting cereal crops and partial cutting of meadows in river valleys), but first and foremost increased the probability of finding victims. The harvest enabled the birds of prey access to valuable and rich feeding grounds, significantly increasing their presence in such habitats. In addition, at this time of the year, young birds start to expand outside of their nests, learning to hunt their prey. August and September are the time when some species (honey buzzard, lesser eagles, short-toed snake eagles and harriers) start their migration to their hibernacula. First areas selected for inspections were those with numerous population of nestling birds of prey, or with large concentrations of birds of prey observed in previous years, in the late summer. Mostly MV lines (15 kV), which comprise >90% of the total length of all inspected power lines, were selected for inspection. Other overhead power lines were 110 kV and 220 kV. In total, 510.7 km of power lines were inspected, twice, within and in the close proximity of following Natura 2000 areas: Ostoja Nieliska, Lasy Janowskie, Puszcza Solska, Roztocze, Lasy Strzeleckie, Ostoja Tyszowiecka, Zlewnia Górnej Huczwy, Dolina Sołokiji, Dolina Szyszły (Fig. 1). During inspections 129 case of dead birds in 25 species were observed. The vast majority (ca. 87%) were cases of electric shock on 15 kV power lines, with a cross design. Shorting occurred when the bird sat on the MV cross-bar touching the conductor wire with a wing. In total, 112 victims of electric shock were observed. Dominant species were: common buzzard (46), white storks (21), and magpie (15), crows (7), common wood pigeons (6) and individual sightings of long-eared owl and the hawk. 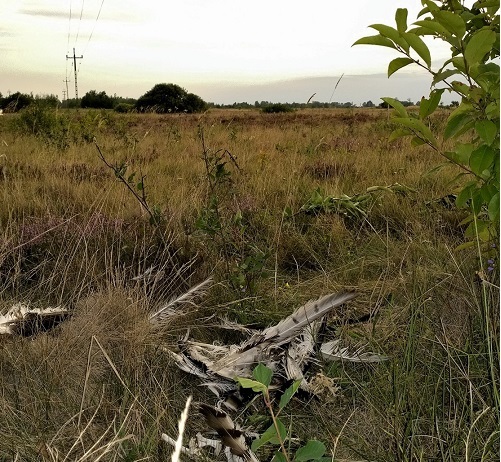 Dead short-toed snake eagle, a victim of electrocution, was also found near Tyszowice. Among power lines 15 kV there are those with smaller generation rate of electric shocks (cross-bar with insulators and conductors suspended on load-bearing structure) and non-colliding ones (cross-bar with insulators and conducting wires suspended under the load-bearing structure). This is important in the context of recommendations concerning design of new power transmission lines or upgrading and repairing the existing grids. Electric shocks were not observed on HV lines (110 and 220 kV), which is due to their design: spacing between insulators on the pylon and the pylon body are large enough to prevent shorting and electric shock. However, the large height and distances between individual pylons (300-500 m) turn the power line into a barrier for migratory birds, causing their death due to collision with conductors or pylons. It is reflected in findings: only in 17 cases death was ascribed to collision with conductors of HV power lines, mostly 110 kV lines. Victims were mostly passerine birds (such as skylark, thrush birds, sylviidae), although also larger birds, such as western marsh harrier or white stork, died too. There were no studies of mortality due to electric shock or collision with power line, conducted in previous years in the Lublin region, with such a broad territorial reach. The only exception applies to a few-year long monitoring of MV power line near Zamość. Based on contribution data from previous years it victims had been assumed to be found mostly under transformers. In actual conditions, the majority of deaths occurred directly on cross-shaped MV pylons. Within study sections, transformers were mostly located near countryside dwellings and were the cause of death only in white storks. Photo 1 One of dead common buzzards found during the inventory. 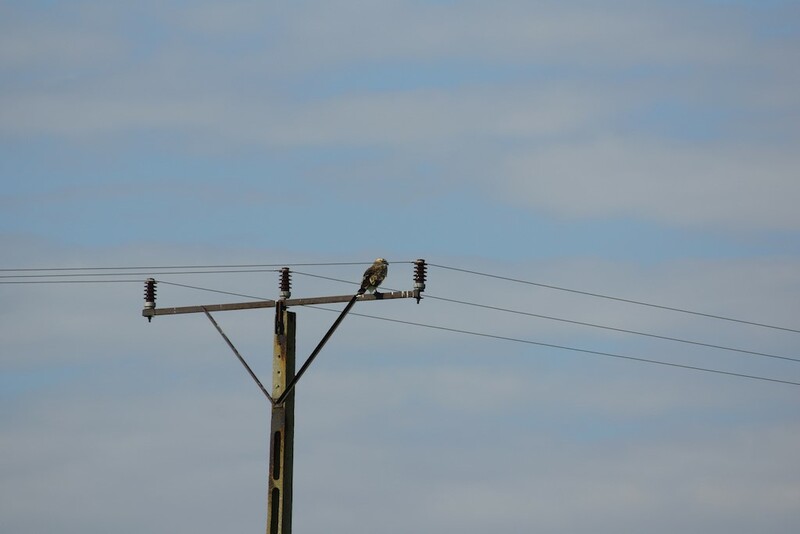 Photo 2 Short-toed snake eagle using the MV power line as his look-out.